Amrita Singh and Saif Ali Khan’s daughter Sara Ali Khan stole the limelight. Bollywood celebrities Aishwarya Rai Bachchan, Sonam Kapoor, Sonali Bendre, Karan Johar, Amrita Singh and others were spotted at the wedding reception of designers Abu Jani and Sandeep Khosla’s relative, Saudamini Mattu, in Mumbai. 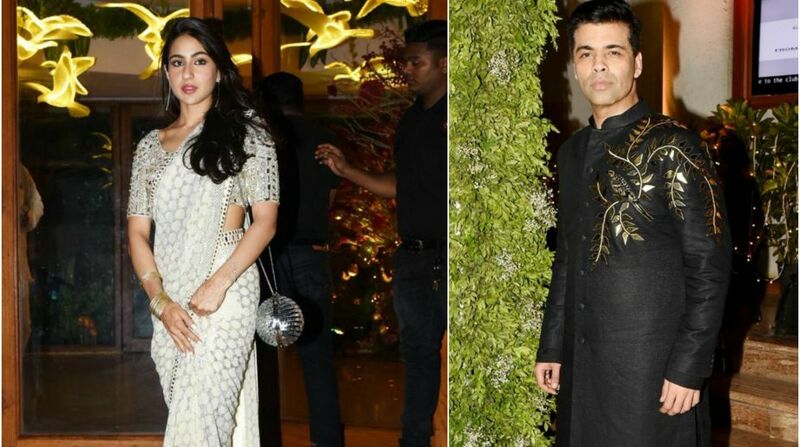 Amrita Singh and Saif Ali Khan’s daughter Sara Ali Khan stole the limelight. She looked drop-dead stunning in a silver shiny saree. She set the stage on fire when she danced to the popular song Saat Samundar. The debutante looked beautiful in a saree and flaunted her thumkas and jhatkas while dancing to the song. Sara is all set to make her Bollywood debut alongside Sushant Singh Rajput with Kedarnath. Director Karan Johar also danced his heart out on his favorite song Radha from his home production film, Student of the Year, which was appreciated by Sunita Kapoor and Jaya Bachchan. Amitabh Bachchan’s daughter Shweta Nanda gave a pleasant surprise and grooved at song Pallu Latke from the film Shaadi Mein Zaroor Aana. Bollywood celebrities won the hearts with their gorgeous attires for the evening.